When Te Shan left northern China on foot heading south, determined to destroy what he had heard as the teaching of a special transmission outside of doctrine, he was a dedicated Buddhist scholar thoroughly attached to formal learning. One day close to the end of his southern journey he met an Old Woman selling refreshments by the roadside. He set down his knapsack to buy some refreshments whereupon the old woman asked what writings had he been carrying that were so dear. 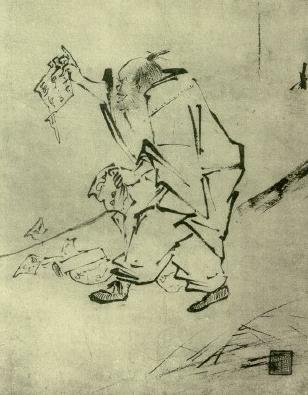 “Commentaries on the Diamond Cutter Sutra,” he responded, commentaries which were actually books on books on ways to reality that he considered so indispensable that he had to carry them with him everywhere he went. The old woman then said, “The Diamond Cutter Sutra says ‘past mind can’t be grasped, present mind can’t be grasped, future mind can’t be grasped’: which mind does the learned monk desire to refresh?” Te Shan in all his scholarly learning was rendered speechless. By the time he reached the monastery he was completely devastated by his ‘defeat’, especially by a ‘mere’ roadside vendor. But Te Shan was no longer there to contend or do battle with the teaching of a special transmission outside of doctrine. Within days all was behind him as Te Shan experienced Awakening under the auspices of Long T’an and the now famous ‘blowing out the candle’ sequence. He then took the torch and set fire to his commentaries, reducing his once valuable books to ashes.